I have a thing for wallets and I’m always looking for minimal designs that I can use when I’m traveling. In my regular day-to-day life, I use a Waterfield wallet, but when I’m at a trade show, on vacation, etc., I only want to carry a few bills and a couple cards with me. I don’t need a bulky wallet that requires me to carry a bag. My usual MacGyver solution has been a binder clip, but I think I have found a worth alternative with the Bandit Wallet. 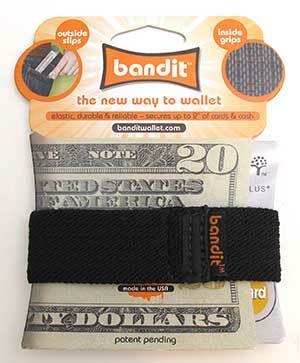 The Bandit Wallet is made in the USA and has a very simple “Why Didn’t I Think Of That?” design. It’s a stretchy elastic band made of Black nylon. 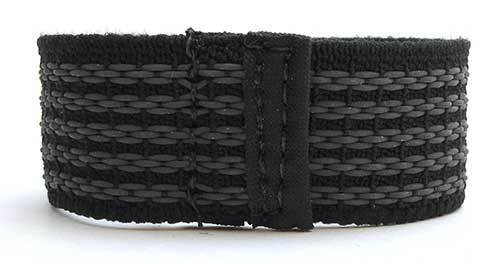 If you turn the Band inside out, you’ll notice that there are strands of rubber incorporated into the fabric. The Bandit Wallet is about as minimalist as it comes. Grab some credit cards, place them into the fold of some cash, slide the Bandit around them and there you go. The band is stretchy but strong. It can hold up to 2″ of cash and / or cards. 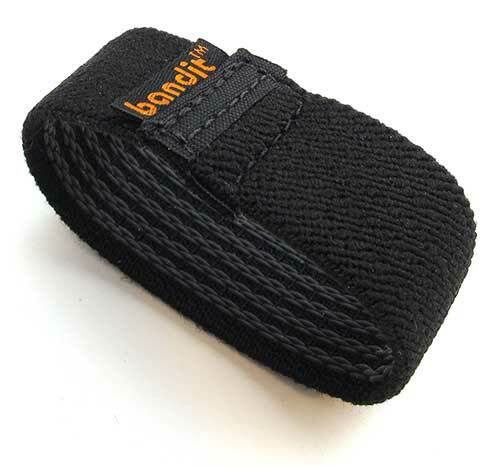 The rubber strands on the inside of the Bandit keep a grip on the contents, so that they won’t slide out accidentally. 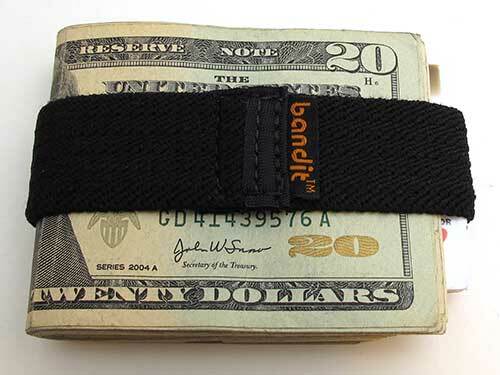 The outside of the band is smooth so that you can easily insert the bundle into your front or back pocket. There you have it, a simple review of a simple product that does its intended job simply. Oh, another plus is that they will donate $1 of every sale to current relevant charities. The All-Ett is nice, but too wallet-y (is that a word?) for me. Is it easy to put the paper money in and out because of the rubber grips inside? @Jackie You have to take the band completely off to add or extract cash or cards. That’s pretty cute. Looks like the same kind of webbing as used in the bands on a Cocoon Grid-It. I doubt the All-Ett is thinner than a Dynomighty Mighty Wallet made from Tyvek (http://www.dynomighty.com/mighty-wallet/). Have you ever looked at the MoneyClamp ( http://www.moneyclamp.com/ )? It works pretty well for the “usually use a binder clip” crowd. Joking aside, I think a clip is more usable: you can access your cards and cash faster. Julie, thanks for keeping the wallet reviews coming. My traditional leather bifold wallet just isn’t cutting it anymore, and I keep hoping that one of the non-traditional wallets that you review here will meet my needs. I keep coming back to the Dosh polymer wallet that you did a spotlight piece on last year. Have you tried to get one of those to review? Er, why not just use a rubber band ? $1 buys you a few hundred. I occasionally do that when moving around without a wallet ( which is admittedly, rare for me ). @Andy very true and yeah, it could! For years, I’ve been using a credit card holder (that came as a removable section from inside a regular wallet) as my wallet. 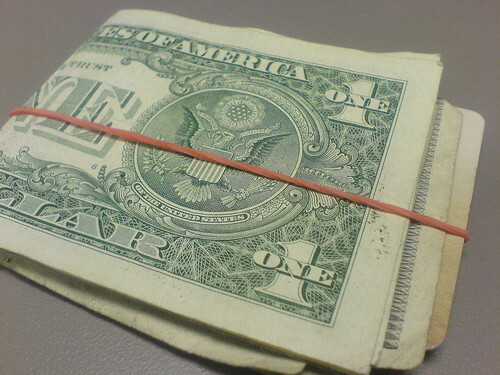 I keep money secured to it with a rubber band. Have been meaning to come up with a better system, so thanks for posting this review. Though the Bandit wallet doesn’t interest me, the Mighty wallet and All-Ett mentioned in this thread look nifty. I couldn’t decide, so I ordered both. The Bandit is fine but the Wag Wallet does it better! It holds your cards, Drivers license, room keys and a spare car or house key in much the same way without releasing the cards or key when you access your cash. I’ve been using it for years and can’t go without it! If you are tired of sitting on a fat wallet and your Chiropractor told you to get off it, you need to check out the Wag Wallet today. WagWallet.com 2 for $15 bucks! Share it with a friend and they will thank you. Rubber bands break when you least expect it and the Wag seems to last forever. Best deal on a wallet as far as I’m concerned. You can access your cards without opening it and it’s made in the good ole USA! How can I purchase a couple of Bandits for my own personal use?